I am so very honored to say that I am friends with this magnificent artist! Illustrator, designer, concepts – Danny Hirajeta does it all. He’s worked on album covers for bands (CD artwork/album books), made his own tarot card decks, journal covers, comics, and has been selling his own prints for as long as I can remember. His site is simple & basic. 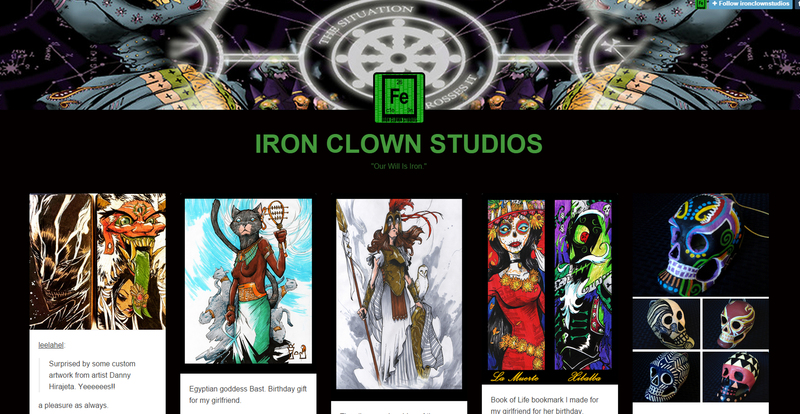 It’s beautifully framed by some of his work and his logo and studio name stand clear and visible for you to see when you first enter the site. Tumblr is his blog server of choice, though I also happen to know he has a Facebook page as well. Unfortunately the only way to find this out is if you google it, as the goober doesn’t have any external links and/or contact information for people who are interested. I would say that is a huge benefit lost for him — many people who look at it might want to get in touch with him and not know how, especially if they don’t have a Tumblr on their own. Despite the lack of artist information on there I’d say there are several other informative qualities about his blog. It’s an excellent place to see examples of exquisite rules of design and color put into practice. His line work is gorgeous, his composition equally complimentary, and the shading beautifully done. It’s a great site to come see examples of professional design & illustration! There isn’t much text involved but he does put little blog excerpts into every art post he makes. Sometimes they contain links or relevant information about the piece, but overall I wouldn’t say this is a life-story blog with lots of text. Instead it functions more like a portfolio where his blog is told in pictures and stories, and though it may not give you an insight into every personal thing he’s up to these days it always keeps you coming back wanting more! Eye candy. Beautiful, morbid eye candy. Who doesn’t want that, right? This entry was posted in Sp15-P3 Blog Search on April 15, 2015 by christaantoniak. Those are some awesome looking images. I like the style of the artist. Very dark!